South East Coast Notification is out. 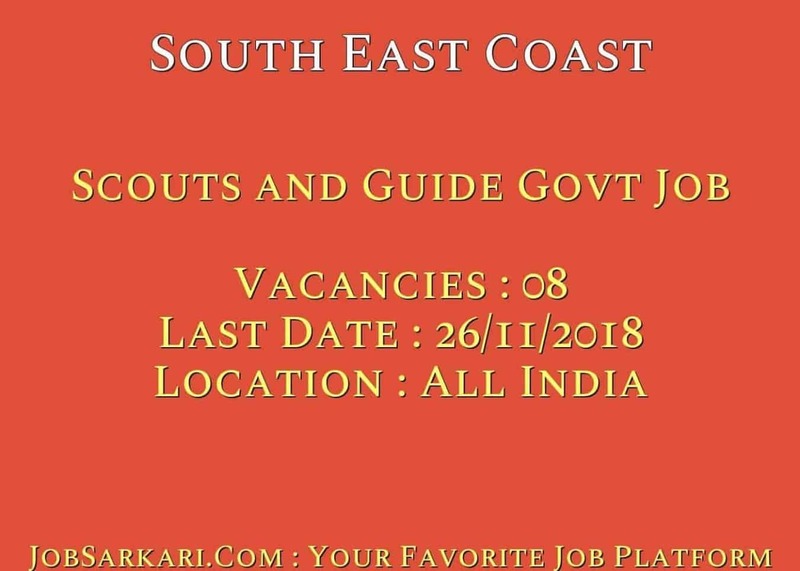 South East Coast is recruiting for 08 Scouts and Guide Govt Job Posts. You can check South East Coast - East Coast Railway zone last date, download South East Coast notification, visit South East Coast official website and check other South East Coast Vacancy details.Complete Vacancy and recruitment Details about 08 Scouts and Guide Govt Job vacancies in South East Coast are provided below by JobSarkari.Com only for you. Last Date for Receipt of Application Form 10/12/2018. Mode of Payment Candidate Need to Draw a Demand Draft in Favor of “Principal Financial Adviser, East Coast Railway, payable at Bhubaneswar”. Group-C Candidate Must Have Passed Class 12th With 50% Marks or 10th With ITI in any Technical Category. 02. Erstwhile Gr.D Candidate Must Have Passed Class 10th With ITI or NAC by NCVT. 06. Total No of Vacanyc 08. Maximum Age for UR Group C 30 Years. Maximum Age for UR Erstwhile Gr.D 33 Years. Maximum Age for OBC Group C 33 Years. Maximum Age for OBC Erstwhile Gr.D 36 Years. Maximum Age SC / ST Group C 35 Years. Maximum Age SC / ST Erstwhile Gr.D 38 Years. 2,Download Application Form Given in Important Link Section. Sadan, Chandrasekharpur, Bhubaneswar, Odisha – 751017 On or Before 10th December 2018. Q. What is the Last Date For South East Coast Scouts and Guide Govt Job Vacancy ? A. 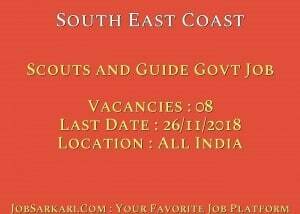 Last Date for South East Coast Scouts and Guide Govt Job Posts is 26/11/2018. Q. What is the Form Type of South East Coast Scouts and Guide Govt Job Recruitment ? A. The Form Type for South East Coast Scouts and Guide Govt Job Posts is Offline. Q. How many vacancies are available in East Coast Railway zone Scouts and Guide Govt Job Posts ? A. There are about 10 Vacancies in East Coast Railway zone Scouts and Guide Govt Job Posts. Q. What is the Full Form of South East Coast ? A. Full Form of South East Coast is East Coast Railway zone . Hi sar I’m 12 standard since student.